Having my customer/prospect information available at my finger tips when a customer contacts me via inbound marketing is key to showing them we can handle their business promptly. Probably the thing I find most useful is at you look at the customer/prospect screen on the CRM immediately on the right screen is a complete history of every contact ever made – email – calls – notes all of of at a glance. Outbound marketing is extremely easy for logging calls and have them lined up and reading to go – Being able to look at every lead on the screen horizontally with whatever field you choose to see – Name, address, Phone number, any custom field, etc. Simple to implement and fast look-ups is the biggest reason I like this system. Pros: Easy to use and Fast. Close is cloud-based, affordable, easy to learn and comes with straight-forward pricing, which makes it the perfect fit for small and midsize businesses. Plans start at $65/user/month. Close is designed with the goal of making sales people as efficient as possible. Make and receive calls with just 1-click. All calls are logged automatically (no manual data entry!). Lead activity information pops up as soon as the phone rings so the data you need is always at your fingertips! Looking at scalability? 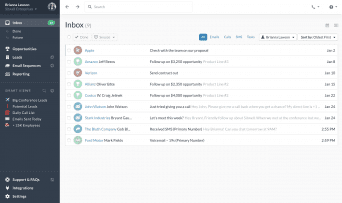 With bulk email automation tools and cold calling features like the power and predictive dialer, you can reach large lead lists quickly and perform high volume sales in Close. The software also provides sales teams with a visual representation of ongoing sales processes. All Plans have unlimited Contacts, Leads and Opportunities. Close subscriptions can be paid monthly or yearly. Yearly subscriptions are 15% off. All Plans include a 30-day money back guarantee. Basic: $65 or $55.25 per user per month: A modern CRM solution with built-in email sync, global calling, and SMS. Professional, $95 or $80.75 per user per month: Same as Basic Plan + Automate your outreach with email sequences and the Power Dialer. Business, $145 or $123.75 per user per month: Same as Professional Plan + Reach more leads with the built-in Predictive Dialer. Enterprise, Contact Directly for Pricing: Same as Enterprise Plan, Personalized Training and Sales Consulting, Integration and VoIP Consulting, Custom NDA, Customer Support by Email or Phone. Basic, Professional and Business plans all offer 24/7 customer support via email. Only the Enterprise plan offers customer support via both email and phone. Close’s website also offers a searchable Support Center with a Getting Started Guide, a Live Training Workshop, a diverse library of how-to articles and FAQs on topics including Search, Account Management, Email, Calling, Integrations, Networking for VoIP and other key functions of the platform. The Support Center also has an Email Support button which allows contact with the company through their website. Close bills itself as a sales communication platform built “by salespeople, for salespeople.” So it’s not really apt to compare it to full-fledged CRM platforms, because Close does not attempt to meet that standard. Therefore, if your business wants robust marketing automation features, advanced reports, or even a mobile application, then you’ll want to look elsewhere. However, if sales is not merely part of your business, but most (if not all) of your business, and your salespeople work primarily from desk-based workstations, then Close has a lot of features your people will love. First, it streamlines contact, lead and opportunity management, and updates itself when the statuses of each are changed. The goal is to reduce to a minimum the amount of data entry required – which the Elastic team felt was a drawback of other CRM options – and the software largely succeeds. 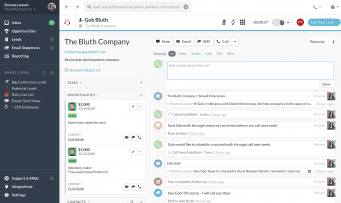 Second, the tight integration of call and email functionality means salespeople can perform the essential functions of their jobs without needing to switch interfaces. (Also note the desktop client and browser-based version are virtually identical.) Close has a built-in VoIP calling system, but recommends Tenfold – a Computer Telephony Integration platform – if you’d like to integrate your existing VoIP provider. Third, all of these features are available to the salesperson via the dashboard, which is not obstructed by the calls. Therefore all the information the salesperson needs on a lead, or related to their interests insofar as the company has learned, is in front of the salesperson’s eyes whenever they need it. When viewing the sales pipeline, each opportunity is populated by the lead names, monetary value over time period, and confidence level. Lead pages are populated by their company’s name, any related tasks, the opportunity and size, all contacts within their company. Within a few clicks the salesperson can switch between detailed views of a contact or lead and a comprehensive view of their relationship with the company. 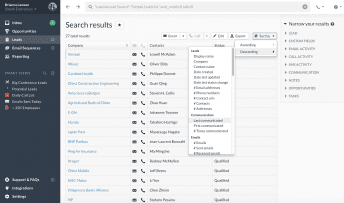 The platform also features a search function based on granular data points within categories, ranging from contact and lead details to phone and email activity to time frame and region. This allows for searches like “San Francisco calls within the past two months that lasted over five minutes.” The platform can save your queries as Smart Views, located on the left-side panel of the dashboard, which allows for instant shortcuts to queries you’ve found useful in the past. Close does not seem to have many official integrations, but it handles its primary functions quite well for itself. It uses Zapier for its third-party integrations, as do many CRMs; this allows it to incorporate functions from MailChimp, Wufoo, and Google Apps. Clients also have access to the developer API. In short, with the automatic calls and email logging, the integrated communication features, and the reduced need for data entry, Close has a lot of features that a sales team could love. The price point is fairly high for a platform lacking in CRM features; on the other hand, Close’s high level of streamlined functionality within that narrow scope may make it well worthwhile to a sales-heavy company. If direct sales over the phone or internet is your primary business, then you have everything to gain by giving Close its two-week free trial. What Do You Think of Close?